Abrasion resistance, anti fading and sound-absorbing effect good, color according to customer requirements. Eight, the metal standard A-class cold-rolled steel plate, stamping and welding pipe, foot by gravity design, can bear more than the average seat pressure, and feet with covert technology, and fixed on the ground with M10 * 80 pull expansion bolts hidden in the soles of the feet inside, no dust shape is smooth, beautiful and generous. After the surface rust, phosphating used thermosetting epoxy electrostatic spray heat treatment, no rust, no deformation. To reach the national standard, strong, high strength. Nine, the bearing mechanism (bracket), chair cushion, back cushion between easy disassembly, convenient installation, has the interchangeability between different chairs; using standard parts, hardware accessories, convenient maintenance. 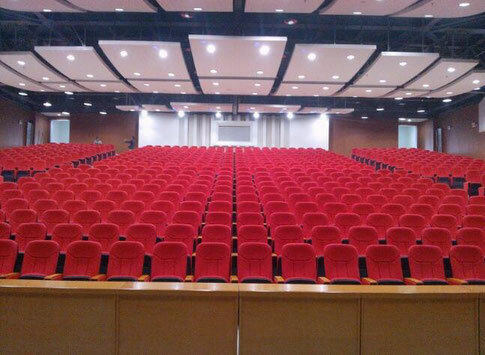 Ten, seat six angle beam using strong resilience (H16), and meet the design requirements of bearing gravity, mechanical properties of the seats are more than 4 test level prescribed by GB103573.3. Eleven, handrails (side panels) aisle side row seat belt fluorescent indicator (Paihao), reflecting each seat has obvious number (number, according to the requirements of the tender side) can clearly show the figure in the dim light. Twelve, the seat can be configured with a built-in high strength board, can keep the aisle smooth in the recovery. The use of ABS engineering plastics molding. The turning shaft seat, handrails and board between reinforcement and durable. And a pen slot on the board, to prevent slipping of the pen.